Marty, Melman, Alex and Gloria are all stuck. The entire Madagascar crew seems to be in need of a subtraction expert to help sort out their problems. 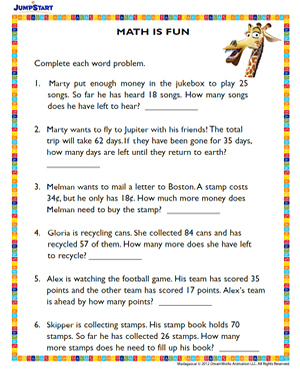 Help Marty fly to Jupiter and Gloria recycle cans by exercising your 2nd grade math skills. Complete each of the 6 word problems with the right answers.